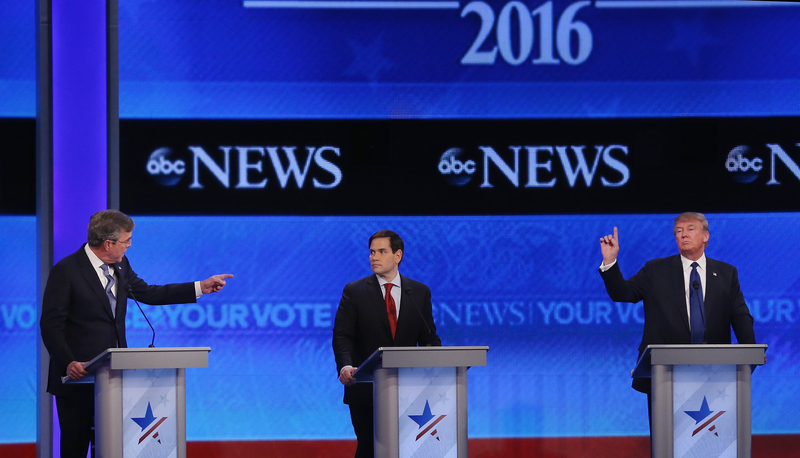 After the New Hampshire primary on Tuesday, the Republican field could narrow once again. While it may not narrow to a face-off à la Hillary Clinton and Bernie Sanders, we will likely have a better idea of who will be vying for the GOP nomination after the results come in Tuesday night. Currently, nine Republicans remain in the race. Three of the nine GOP candidates seem likely to drop out, and we could even see four throw in the towel if their portion of the vote resembles the latest polls. Firstly, Carly Fiorina, the former HP exec, is likely to throw in the towel. She wasn't even included in ABC's Saturday night GOP debate in the state. Despite doing better than Christie and Kasich in Iowa, ABC was not convinced to let her participate. This compared with her low polling numbers — she looks likely to get about 4 percent of the vote — do not bode well for her campaign. Nationwide she polls even lower and in the following primary vote in South Carolina she polls at an abysmal 1 percent. Fiorina has pledged to stay in the race, and has given some stellar debate performance, but chances are it's just a matter of time before she exits the race. Then, there's John Kasich, the governor of Ohio, who's still running as a Republican despite his sense of humor. Unless he can pull a major upset here, breaking the top three, there's not many places his campaign can go. He came in behind everyone still in the race in Iowa — except Christie and Gilmore (again he got just 12 votes). In New Hampshire he's currently polling an average of just over 12 percent, which would put him in fourth. Not a bad showing, but he'll need more momentum than that to make a difference in South Carolina or nationwide where he's in the 2 to 3 percent range. The other clear choice is New Jersey Governor Chris Christie. He's betting big on New Hampshire after a dismal showing Iowa. In much the same position as Kasich, except with even poorer poll numbers. Christie might have more name recognition but it has not translated into likability. He's also suffering in his home state, with approval ratings lower than they year after his bridge-closing scandal came out in the press. One last possibility is retired neurosurgeon Ben Carson, who looks to do even worse than Fiorina in New Hampshire. He's currently polling at less than 3 percent in New Hampshire. I would have mentioned him first, but he did do well in Iowa, pulling in just over 9 percent of the vote for a fourth-place finish. That compared with his decent (if decreasing) national poll numbers and potential South Carolina showing will keep him relevant for a while longer — unless he takes more trips to wash his clothes, neglecting the campaign trail. Numbers-wise, it might make sense for Bush to drop out too — nationwide he polls even lower than Carson (just under 5 percent compared to Carson's just under 8). But he is ahead in both New Hampshire and South Carolina. His donors are ready to call it quits, but he'll probably stick with it at least a few more weeks. Sooner or later, another these candidates are going to bite the dust. Stay tuned for the concession speeches.